Labor is under pressure to support the ban, but then there's the UN Refugee Convention. Prime Minister Malcolm Turnbull is "satisfied" the lifetime ban is "within power and consistent with our international obligations." CANBERRA – Prime Minister Malcolm Turnbull has refused to detail how moves to apply a lifetime ban to refugees don't breach Australia's international obligations, only to say, "I am assuring you that it doesn't". 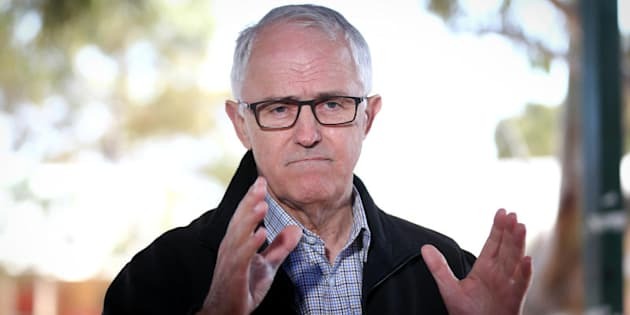 While on a visit to remote South Australia, Turnbull backed Immigration Minster Peter Dutton's defence of the proposal to amend the 1958 Migration Act to prevent boat arrivals, or attempted arrivals, from ever getting an Australian visa. "We have taken legal advice and we are satisfied it is within power and consistent with our international obligations," the Prime Minister told reporters in Yalata. Earlier, the Immigration Minister insisted "We are absolutely not" in breach of Australia's refugee obligations. The move, which is being fast-tracked into parliament next week and which Labor is being pressured to support as a "very reasonable measure", has prompted renewed expectations of a cross-Tasman deal to allow New Zealand to resettle 150 refugees, but it has also been condemned as "punitive," "barbaric" and in breach of the 1951 UN refugee convention. Article 31 of the Convention states signatory nations "shall not impose penalties on account of their illegal entry or presence". "The announcement is absolutely consistent with our international obligations," Turnbull repeated. The Turnbull Government's proposed ban applies to refugees, who attempted asylum by boat, even if they attempt to come to Australia later as tourists, for business or for a funeral. There would be exemptions for children and the Minister would have discretion. When asked how the proposed measure does not contravene the UN refugee convention the Prime Minister responded, "I am assuring you that it doesn't". The United Nations children's agency UNICEF said the lifetime ban, which would apply to all adults detained at the Manus Island or Nauru detention centres from July 19, 2013 -- including those who have chosen to return home, is "not a reasonable, necessary or proportionate measure". It also said it was "entirely unnecessary" and "squarely punishes refugees more than it creates a credible warning to people smugglers". The Government is expecting Labor to support the legislation with Dutton insisting it fits in with the Opposition's policy of not allowing boat arrivals to settle in Australia. Crucial crossbench senator Nick Xenophon, who has previously supported the Government on tough immigration policies, wants to see the legislation. New Zealand has long offered to take 150 of the refugees and it is thought this new lifetime ban plan will pre-emptively shut down a new backdoor to Australia.